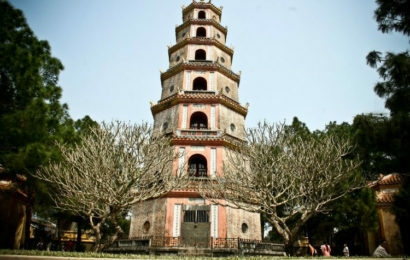 Had Ho’s will been followed, though, the construction of the Mausoleum would never have come to pass: in his will, the founder of the modern Vietnamese state specified that his body be cremated, with his ashes scattered over the north, center, and south of his country. The Vietnamese government did the absolute opposite of his wishes. Instead, they gave him the Soviet leader treatment (same as Lenin, Mao, and Kim Il-Sung) – embalming his body and installing it in an imposing concrete-and-granite block that stands before a vast square. 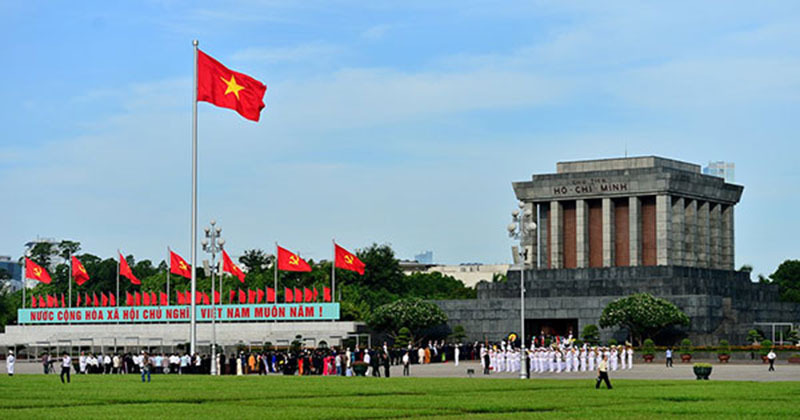 Construction of the Ho Chi Minh Mausoleum began a few years after Ho’s death in 1969 – workers broke ground on September 2, 1973 and officially finished upon the mausoleum’s inauguration on August 29, 1975. Ho’s Mausoleum takes some inspiration from Lenin’s in Moscow, with its dour, angular façade of gray granite. 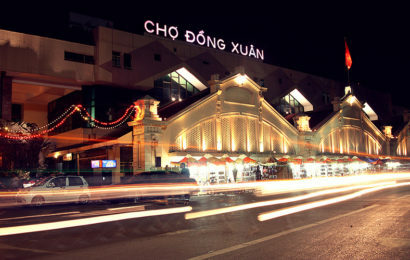 Above the portico, the words “Chu tich Ho Chi Minh” (President Ho Chi Minh) can be clearly seen chiseled into the pediment, which is supported by twenty stout granite-covered pillars. 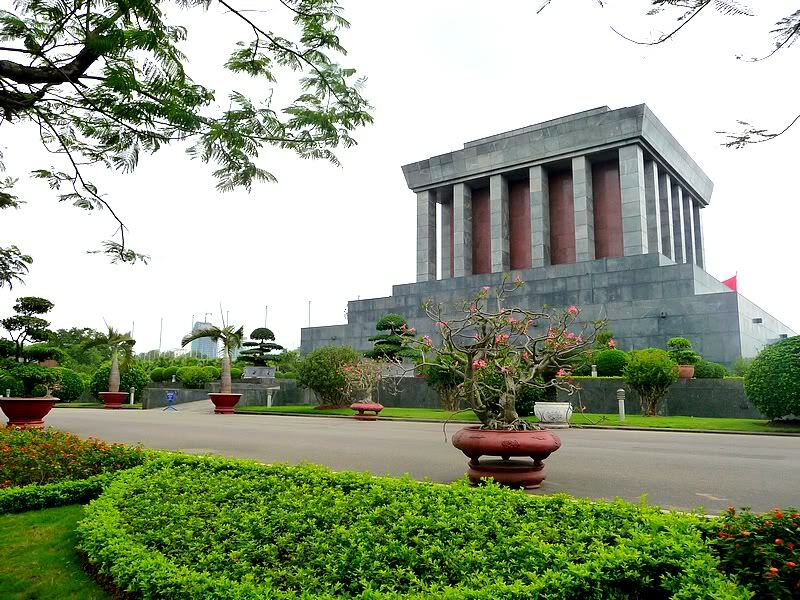 The rectangular mausoleum is 70 feet high and 135 feet wide, creating the impression of a massive bulk looming over Ba Dinh Square. 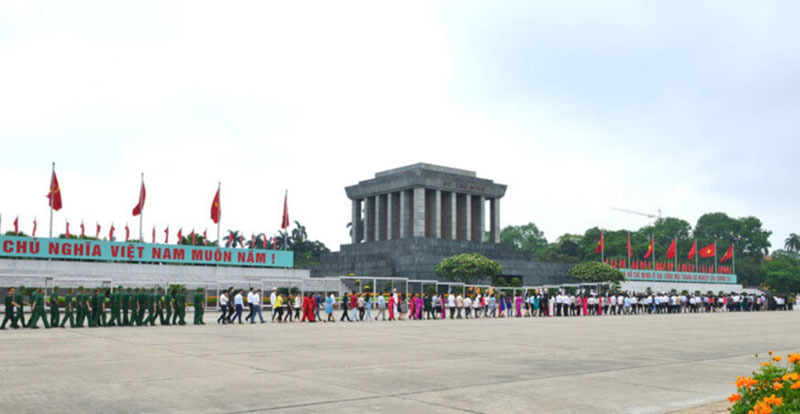 To enter the Ho Chi Minh Mausoleum, you’ll have to join a snaking queue of locals and tourists waiting to enter. 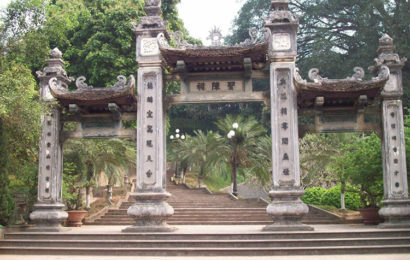 The queues to visit the inner sanctum can get quite long, and the wait can be interminable – visiting the Ho Chi Minh Mausoleum is a highlight for many locals’ visits to the capital, and very few Vietnamese visiting Hanoi pass up a chance for a pilgrimage to the father of their country. Tourists are expected to surrender bags and cameras before entering the mausoleum; if you’re part of a tour, you’ll hand them over to your guide. Then you wait as the line slowly files through the door into the inner sanctum. Inside the Ho Chi Minh Mausoleum, Ho’s body lies in state under a glass sarcophagus, overseen by an honor guard of four sentries standing at each corner of the bier. The embalmed body is extraordinarily well preserved, and dressed in a khaki suit. His face and hands are illuminated with spotlights; the rest of the room is dimly lit. Great respect must be shown while entering – chattering, hurried movements, and indecent attire will be singled out by the mausoleum guards. Visitors are expected to keep quiet and walk slowly and steadily through the mausoleum. Upon your exiting the Mausoleum, you can continue your “re-education” in the Ho Chi Minh mythology by visiting the nearby Ho Chi Minh Museum, which contains an account of the man’s life as told in allegory and his personal effects, and the Presidential Palace, on which grounds Ho Chi Minh lived after taking power (he never really moved in, contenting himself with living in the former electrician’s quarters, then in a custom-built stilt house from the 1950s till his death). Do maintain an attitude of respect. Don’t talk, don’t smile, and walk slowly along with the queue into the darkened inner sanctum. The guards will not hesitate to single you out if you don’t maintain the proper attitude. Do come early. If you want to be ahead of the queue, it’s important to avoid the rush of people who line up early to pay their respects. The mausoleum opens at 8am, but be there by 7am. Don’t take pictures. Actually, you won’t be able to – the guards collect all cameras before you enter the mausoleum. You will be able to reclaim your personal effects as you leave the area. Don’t wear shorts. Or singlets, or sleeveless shirts. This is one of the holiest sites in Vietnam, if such a word may be used in a Communist country; dress up with a modicum of decency, and wear clothes that cover you up, even in warm weather.